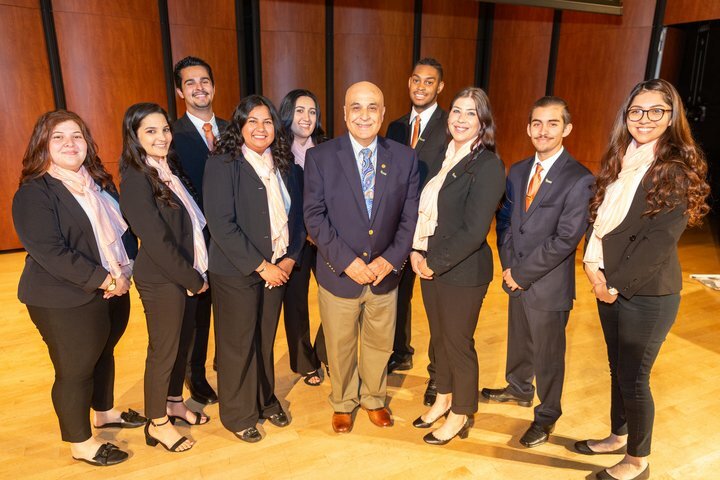 University of La Verne Professor of Management Dr. Issam Ghazzawi has won the Jack Kahl Entrepreneurial Leadership Award in recognition of his contributions to the Enactus program, which shows students how to change the world through entrepreneurial action. Ghazzawi, who has taught at the University of La Verne since 2005, received the award during the Enactus National Exposition in Kansas City, Mo. in May. Ghazzawi serves as adviser for both the Enactus program and the REACH business camp. He brought 20 years of executive management experience to the University of La Verne, passing along his knowledge to his students. He teaches organizational design, theory, and behavior, as well as management. The Jack Kahl award is given to a college professor who has done the most to advance the entire Enactus organization. The award rounds out what has been a successful year for the University of La Verne Enactus team. The team celebrated its 12th win at the regional level and also participated in the national competition, where nearly all members received sales and management job offers from companies such as Unilever, PepsiCo, Hallmark, Schwann Foods, and Sam’s Club. In late February, students, faculty, and staff crossed the border into Mexico to help a street vendor with tools and tactics to improve sales. They bought him cooking equipment, supplies, and a bicycle cart so he could reach more customers. The 17 members of the team gathered at Solar Solutions in San Diego in October to build AquaPaks – solar water pasteurizers invented by the company’s CEO, Frank Husson. AquaPaks are plastic bags that produce potable water when placed under the sun for about 90 minutes – enough time for solar radiation to kill any bacteria or viruses. They sent assembled packs to Cambodia, a country that has about 6.3 million residents without access to safe drinking water. Students also led projects closer to home, including planting vegetable gardens at elementary schools to educate children about healthy eating, collecting business clothing to help recent college graduates in the Philippines and high school students in Pomona get jobs, and removing used fishing line from the California coast to convert into fishing nets for fishermen.